Since this is my first professional website and, consequently, my first blog post on said website, I thought it would be fitting to christen the site with a series of reflective tributes to my teachers, past and present; teachers without whom this page and my musical life experiences would not be possible or even a reality. As a saxophonist since the 4th grade eager to take up the clarinet as soon as I could, I couldn't have had a more amazing opportunity than to study with Mr. Knakal. His teaching has provided me with a solid musical, rhythmic, and tonal foundation that steads me to this very day. I fondly recall, or maybe not so fondly recall, going through the P. Bona book of rhythmical articulation wanting desperately to catch up with the other clarinetist from my high school and more globally and to the point, from my district who also studied with him, or conscientiously mapping out my musical journey through the Rose 32. Because of his can do attitude and seemingly limitless faith in me, I found myself staying up until the wee hours of the morning; I'm talking 2, 3 o'clock in the morning; practicing the clarinet, working to improve my articulation so that I could play my chromatic scale at quarter note equals 120 slurred up and tongued down and win a high enough chair in district band to go and audition for All-State, learning how to circular breathe, do the glissando or "smear," as he comically referred to it as, from the opening of Gershwin's Rhapsody in Blue because one of my best friends who was also one of his students got to perform it with Governor's School for the Arts and I wasn't about to have her do something I couldn't do. He inspired, encouraged, and motivated me to be better than I thought I could be and to achieve great things through lots of hard work and listening. Mr. Knakal was and is a super amazing pedagogue. Gun to my head, if I had to select one thing I got from each of my teachers, identifying the most lasting characteristic of their teaching and playing that I hold on to or that I think is most evident in my playing, from Mr. Knakal, I have to say, it would be his sound or rather his concept of sound. Mr. Knakal was the first person to formally introduce me to classical music and, more specifically, to my tonal ideal, Harold Wright. As a child, I grew up listening mostly to gospel, R&B, and blues. My sister loved hip-hop and reggae; my mother loved gospel and easy listening with a touch of Reba McEntire, and my dad "Down Home Blues" all night long. Heck, even my grandfather unwound with his Afro-Cuban jazz leaving the lighter stuff like Barbra Streisand to my grandmother. The idea of classical music wasn't foreign persay but it wasn't something that I regularly consumed. In middle school, my family and I discovered that I could sing and so a lot of my earliest encounters with music were as a vocalist, singing in the gospel choir at church, not knowing a thing about written music, but relating to it and feeling connected to it on an entirely different level. It was like a spiritual, improvisatory intonement guided by faith, relationship, and joy. To transfer these intangible qualities of gospel music to classical music which boasts a LONG and presumably SERIOUS canon of seemingly rigid and structured music, would be an accomplishment. Mr. Knakal did just that. All of the beauty, lyricsm, and freedom of Mr. Wright's playing was evident in Mr. Knakal's style and approach to the instrument. His vocal tone, singing style, and musical shadings inspired by creativity and a love for a pure, beautiful tone color were infectious. Mr. Knakal gave me my voice, one that, when conceptualized, I envision to be a sorta deep burgundy, mulberry wine-colored velvet with a luster and shimmer as if a silver and gold thread was weaved throughout it. 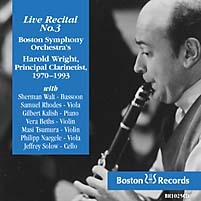 I can recall spending hours listening to recordings of clarinetists like Jon Manasse, Sabine Meyer, Karl Leister, and Guy De Plus, and loving every one of them, while always feeling clandestinely drawn to Harold Wright's sound as if it were home beckoning me. Mr. Knakal's admiration for Harold Wright was contagious and I was not immune, thankfully so. To this day, because of how Mr. Knakal's playing was so beautifully informed by that of Harold Wright, I still feel sumptuously at home when listening to Harold Wright's recordings, especially the Brahms Quintet, the Weber Quintet, and the Brahms Trio (click on the link to download it for free) with Jules Eskin on cello and Gilbert Kalish on piano. The second movement is exquisite. Absolutely. Exquisite. To give you an example of the power of this gift that Mr. Knakal had graciously given me, I offer you a tale in the style of one of my favorite characters, Sophia, from one of my favorite shows, The Golden Girls: Picture it, Tallahassee, 2002 or was it 2003? Anyway, a young clarinet boy finds himself alone in a new city with just his clarinet and his dreams. He spends his days practicing, going to class, and practicing some more. 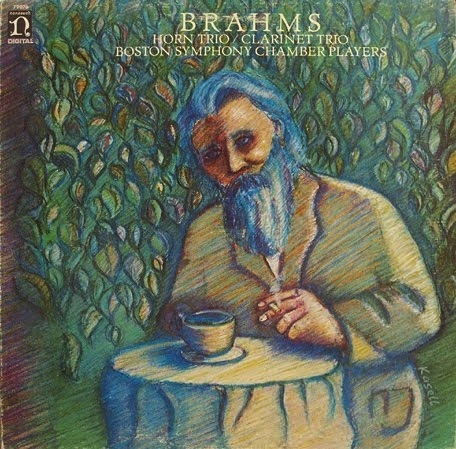 For him, the only respite is the Brahms Trio and Quintet, two pieces he has wanted desperately to play but knew all too well that he wasn't yet ready technically or emotionally to tackle them. So he waits and listens... and practices. Waits and listens... and practices. Whenever he would feel down, fatigued, or in despair he would quietly sneak down to the music library and check out the scores to the Trio and the Quintet, slip outside to the pit that faced Copland St. and, with his A clarinet, gently play through the parts of them that spoke to him, that resonated within him so precipitously. Yes, that young boy was me and that quiet respite was made possible by THE Mr. Knakal. In providing me my voice, Mr. Knakal gave me a source of solace, comfort, and identity within the great canon of clarinet players. This identity has helped me to feel kindred to a time and place that had been foreign and unattainable, a dream. It connects me to other musicians like me who have fallen madly in love with a beautifully singing tone quality. It was because of this relationship with the Brahms Quintet, made possible by Mr. Knakal by way of Harold Wright that I went and studied for grad school where I studied and with whom I studied, but that's a story for another time. It is because of Mr. Knakal's reverence for Harold Wright's interpretation and my weekly interaction with him, someone who knows and can communicate so expressively that sort of tonal ideal, shading, nuance, phrasing, intimacy that I am able to trudge on when success looks more than impossible to achieve, when I feel I'm on the cusp of greatness. In finding my voice, I've found an unyielding passion that propels and motivates me. It's a matchless thing I was given and for that I am very very grateful. This is not to say that I didn't learn anything else or that Mr. Knakal didn't imbue my playing with any other lasting characteristics, on the contrary, this is just one of the myriad of things he's passed on and one of the most important things that distinctively mark my time with him as my teacher from my sophomore year to my senior year of high school. Thank you Mr. Knakal.